U.S. News and World Report ranked AdventHealth Wesley Chapel as a 2018-2019 High Performing Hospital for hip replacements. 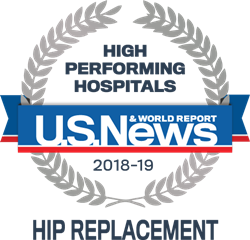 AdventHealth Wesley Chapel has been named a 2018-2019 High Performing Hospital for hip replacements by U.S. News and World Report. The U.S. News analysis of hospitals includes data from nearly 5,000 centers across multiple medical specialties, procedures, and medical conditions. Scores are based on a variety of patient outcome and care-related factors, such as patient safety and nurse staffing. AdventHealth Wesley Chapel scored excellent for patient experience and prevention of prolonged hospital stays. “AdventHealth Wesley Chapel is committed to having the best doctors and most advanced medical equipment so that our patients have the best outcomes possible, and this award recognizes that dedication by our leadership and our staff for the high quality of care they deliver,” said Denyse Bales-Chubb, President and CEO of AdventHealth Wesley Chapel. U.S. News ranks nearly 5,000 hospitals in 16 adult and 10 pediatric specialties. Hospitals also receive a rating in nine common procedures and conditions, including hip replacement and COPD. To be nationally ranked in a specialty, a hospital must excel in caring for the sickest, most medically complex patients. The West Florida Division of AdventHealth has some of the nation’s brightest medical minds making lifesaving breakthroughs in the Greater Tampa Bay region. We are surgical pioneers, scientists and researchers with leading edge technology and innovation for the best medical experts to deliver our brand of inspired, compassionate care to every patient, every time. Our network of care includes AdventHealth Carrollwood, AdventHealth Dade City, AdventHealth Lake Placid, AdventHealth North Pinellas, AdventHealth Ocala, AdventHealth Sebring, AdventHealth Tampa, AdventHealth Wauchula, AdventHealth Wesley Chapel and AdventHealth Zephyrhills, as well as three freestanding offsite Emergency Rooms including AdventHealth Central Pasco ER, AdventHealth Palm Harbor ER and AdventHealth TimberRidge ER. We also have post-acute care, physician groups, Express Care at Walgreens clinics, urgent care centers and home health care. As part of AdventHealth, a faith-based not-for-profit health care system, our mission, Extending the Healing Ministry of Christ, is at the center of everything we do. AdventHealth has hundreds of care sites and nearly 50 hospitals across the United States, dedicated to treating body, mind and spirit and delivering whole-person care to our communities. For more information about AdventHealth, visit http://www.AdventHealth.com, or Facebook.com/AdventHealth, and for specific details on the West Florida Division of AdventHealth, click here.